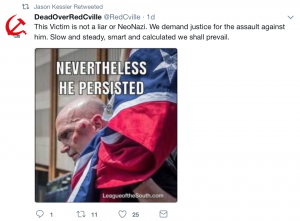 Kessler, while disavowed by other white nationalists like Richard Spencer after the tragic events of Unite the Right, which left one counter-protester dead, has managed to maintain a consistent following on social media. He continues to be propped up by supremacist websites such as Occidental Dissent and the Daily Stormer and has an active following on Twitter. The language used by Kessler to launch New Byzantium is entirely reflective of modern hate speech, which is masked by allusions to western civilization and European heritage – both of which have been powerful recruitment tools for white nationalists, supremacists, and the alt-right. Statements made by Kessler on New Byzanitum, like, “We maintain traditional values distinct from mainstream society, which in its self-destruction, mirrors other great civilizations which have grown weak and disintegrated,” reinforces the idea of ethno-nationalism espoused by all spectrums of the white supremacist, nationalist, and alt-right movements. Ethno-nationalism is a form of nationalism and identity politics that defines the idea of nation or statehood through terms of ethnicity, and in the case of Kessler and his cohorts, white European identity. While Kessler’s new group has only a small following on social media, it provides one more outlet by which violent white supremacy can be advanced throughout the Commonwealth. Indeed, the recent arrest warrant issued by a Charlottesville magistrate against DeAndre Harris from a complaint originating with neo-Confederate Harold Ray Crews is a symptom of the kinds of creeping success that white nationalism can have in Virginia. Harris’ attorney, S. Lee Merritt reinforced this sentiment in a statement, indicating that the charge was part of a campaign by the League of the South to, “manipulate the Charlottesville judiciary and further victimize Mr. Harris.” Kessler has blogged and tweeted in support of the League of the South. The neo-Confederate rally this weekend is shaping into a larger, messier situation. Richmond Police hosted a series of briefings and forums Thursday night to share information, and CSA rally co-organizer Tara Brandau held a press conference this morning to answer questions about their plans. The presser was short and mostly a reiteration of the group’s statement that they seek a peaceful demonstration in support of the General Lee statue. Brandau was flanked by two co-organizers bearing Confederate flags as she took a few questions. The group was not as visibly armed as they’ve been in their social media posts, but the shape of a holstered handgun was apparent under Judy Crompton’s t-shirt as she filmed the press with her smartphone. 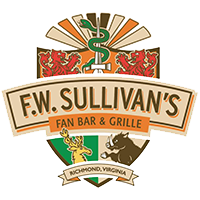 The group has been much more active on social media, documenting their drive into Virginia, announcing discounts on any merchandise supporters purchased during the rally, and airing beefs with local Confederacy groups. 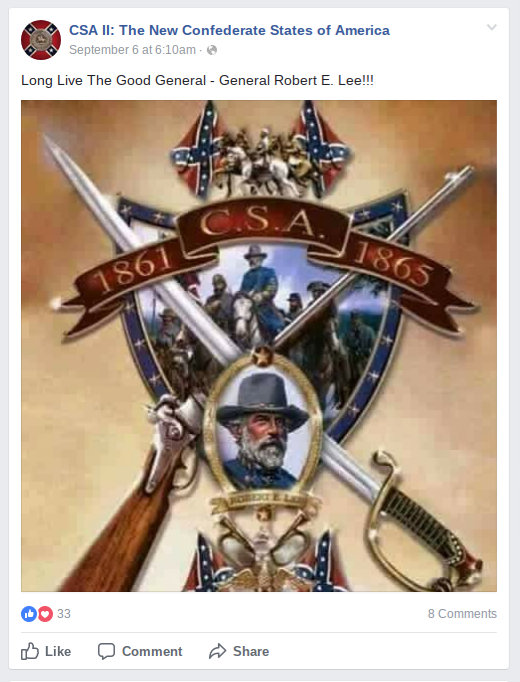 They’ve attacked the Sons of Confederate Veterans in a post calling their anti-rally stance “completely unacceptable” and asked followers to make the sentiment go viral. He was also critical of counter-protesters, underscoring a message of no-tolerance policing for the weekend. “They don’t play by the rules, but we’re going to introduce them to the rules.” The police did highlight one local counter-protest group as being law-abiding and cooperative, in later remarks by Captain John O’Kleasky. He highlighted the Richmond Peace Education Center, one of the organizers of a rally and march starting this Saturday at the Maggie Walker statue on Broad Street as a group they’ve worked successfully with around peaceful protests. “How should counter-protesters protect themselves from being shot on Saturday, especially as you’re not allowing safety gear?” said one woman, touching on a theme that would resurface throughout most of the questions. 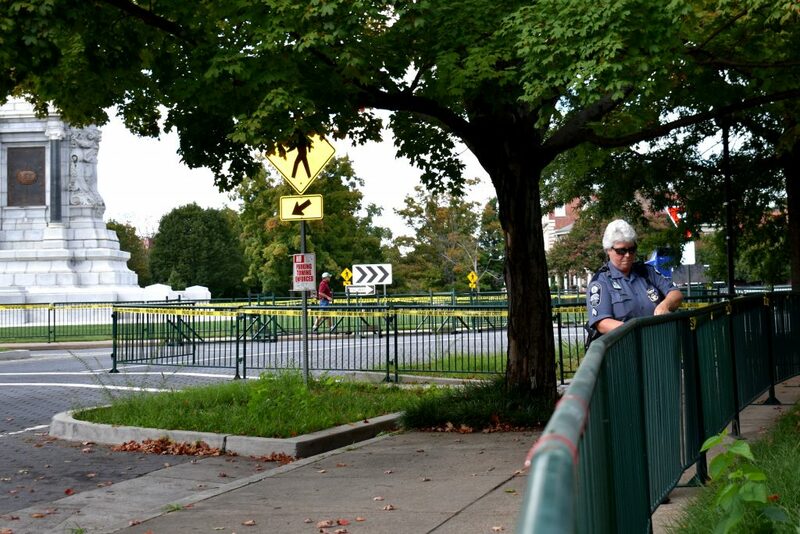 Other residents were more worried about their cars, a sentiment that seemed banal and small by comparison to the fears of gun violence and car attacks. 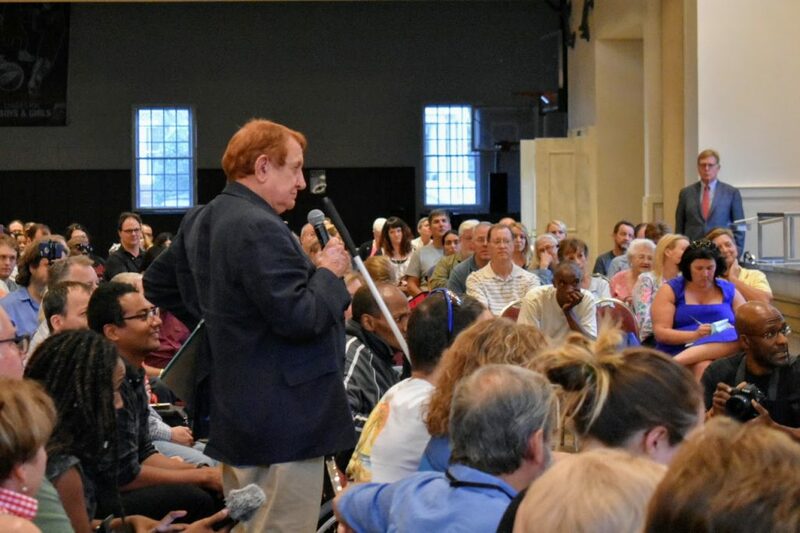 One man stood up to ask Chief Durham if he was providing off-site parking for neighbors, perhaps in the DMV lot or at the Bookbindery building. Another common theme was around Constitutional rights and state laws. “Why can’t the Governor temporarily ban open carry?” one man asked. Others seemed confused by the Governor’s temporary ban of protests on state property versus the Constitutional right to assemble, asking why the city can’t ban all assembly this weekend. The trauma of Charlottesville haunted many residents. An African-American man asked for specific advice for people of color, referencing the brutal beating of Deandre Harris by neo-nazis in Charlottesville. 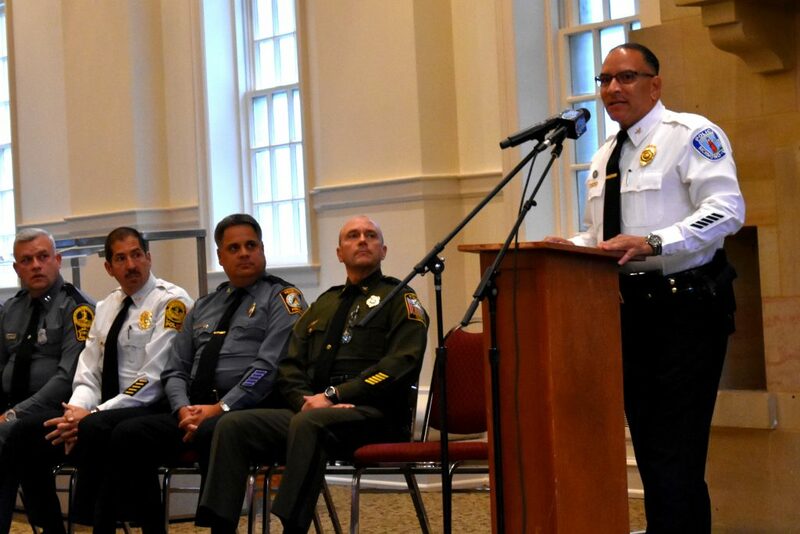 “Every person here has the right to defend him or herself,” Cheif Durham responded. He asked that anyone who witnesses an assault provide video and photo evidence to the police as soon as possible, noting that it can be hard to track down out-of-state people without community support. Early into the meeting, a woman voiced her concerns over moderate voices being silenced. “Protests happen because people want to raise their voice and there is no other place to do that. Why doesn’t Richmond give people a space to debate this?” She opined that people who say “Heritage, not hate” don’t have a voice. Chief Durham didn’t respond to her or other political comments, but a later speaker did and pushed back against an introductory remark the Chief made about Richmond not asking for this rally. 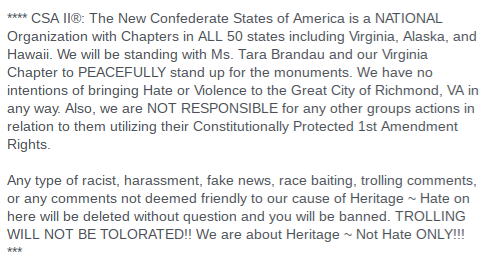 It went unmentioned, but the phrase “heritage not hate” is found all over the website and Facebook page of the CSA II: The New Confederate States of America group that organized the rally. One woman said she’d emailed copies of social media posts by Tara Brandau to the RPD, who frequently poses with firearms and has written that she’s ready to “take out the trash” in response to comments about counter-protesters. “I’ve gotten no response from the police,” she said, referring to the posts as a threat. 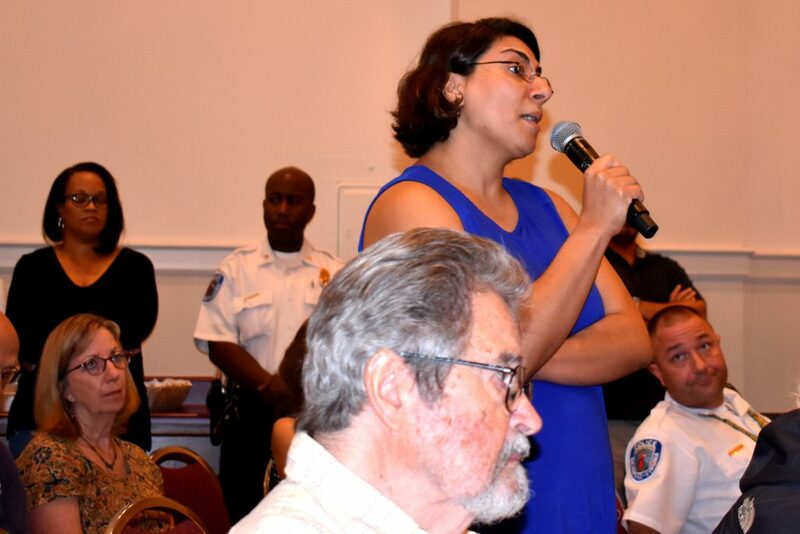 Monument Avenue residents asked about the logistical challenges of protecting their neighborhood, and Chief Durham agreed with them. “This is a unique situation. Other protests were in parks, this is in a neighborhood.” One man asked about coordination with other city departments; the Chief confirmed that they’d be working with the Department of Public Works among others. “What about dogs?” The man asked. After more questions about firearms and logistics, James Edwin Ray, 1st Lt. Commander of the Richmond Sons of Confederate Veterans chapter, rose to clarify his organization’s role. “Our members were told not to go to this rally, or to Charlottesville. We are not affiliated. Please do not confuse us with these lunatics,” he said, referring to the CSA II. Chief Durham: “You are right. The militias wear the same tactical equipment as law enforcement now.” He explained that most police will be wearing regular uniforms, but his tactical teams would be in “turbo gear” and would be recognizable by the badge numbers on the back of their helmets. Anyone looking for more information should follow police updates on Twitter and Facebook. The department will be providing information as quickly as possible over social media. Citizens are advised to call 911 to report anything suspicious and can call the Joint Information Center (JIC) at 804-646-1095 with non-emergency questions. The police and Mayor Levar Stoney have both advised that residents avoid the area around the Lee Statue if at all possible. 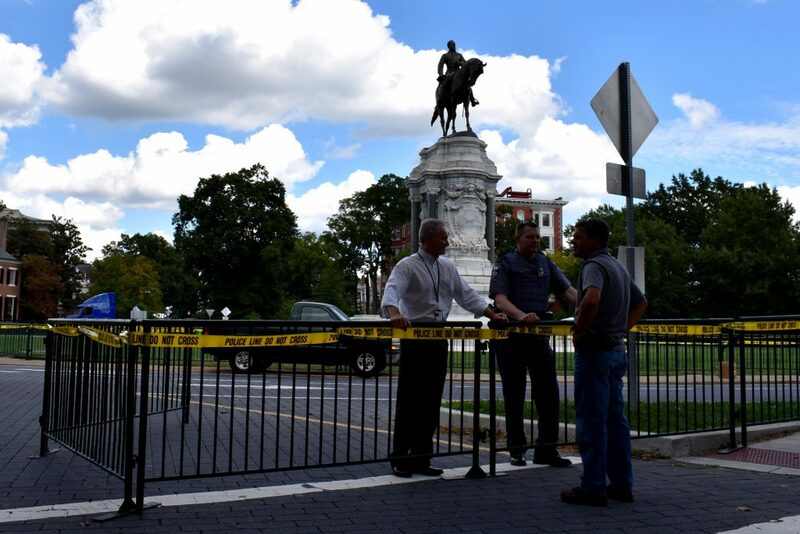 As of Friday afternoon, Capitol Police and private contractors had erected barriers on the roads leading to the Lee Monument and set up fences blocking street access to homes. Neighbors in the street were cautious but expressed confidence that police were managing the situation and would keep them safe during the rally. Saturday’s neo-Confederate rally is shaping into a larger event, with an announcement from Black Lives Matter of Greater New York (BLM NY) that they’ll be attending. 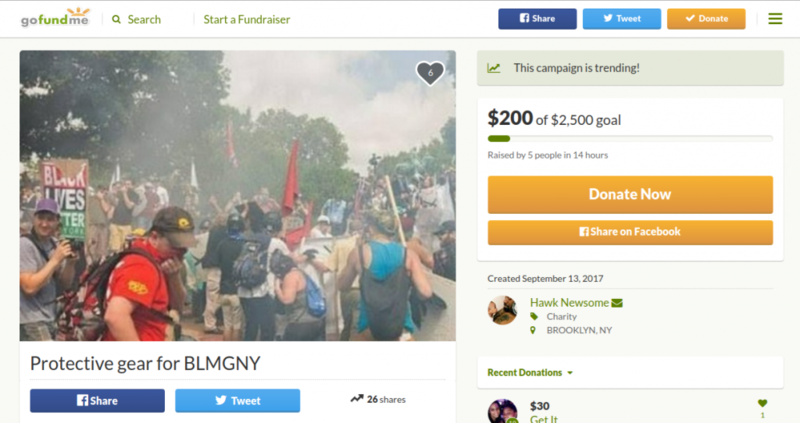 The group is seeking donations via GoFundMe to purchase protective gear for the rally. We’re going to Richmond, Va to counter-protest the continuous terrorism, hate, and bigotry in America. There’s a rally taking place September 16, 2017 to defend the Robert E. Lee statue and to promote the Confederacy. In the name of freedom, liberation for Black people/POC, and Heather Heyer (the brave soul that was murdered by a white supremacist) we will continue to fight! Although CSA II: The New Confederate States of America, the group behind the rally has explicitly disinvited the violent protesters that appeared in Charlottesville, they are planning to open carry, and local residents have expressed concern about the rally leading to violence, unintentional or not. “We are going to Richmond Virginia tomorrow night to protest white supremacists on Saturday morning. This is another protests around the statue similar to Charlottesville,” wrote Hawk Newsome, BLM NY President, in a Facebook post from earlier today. The group announced their plans to attend last night, marking one of the first significant national counter-protest group coming. This announcement comes as the Richmond Police Department have expanded the no-parking zones previously announced and issued a statement asking citizens to report any suspicious activity to 911 and sign up for the municipal codeRED alert system. They also advised locals to stay clear of Lee monument this Saturday owing to the potential for violence. The RPD is holding a press conference at the police training academy at 3:30 PM today and a community meeting at the First Baptist Church on Monument Avenue tonight at 6 PM. Richmond is on edge due to the imminent arrival of an out-of-state pro-Confederate group rallying in support of the Lee statue on Monument Avenue this Saturday. Local clergy and church groups, along with the Richmond Peace Education Center, describe the effort as white supremacist and are organizing a march for racial equality in support. Grassroots groups like the newly-formed Community of Richmond Virginia (CORVA) are mobilizing to protect their neighbors from the assembly, and some residents are making security plans or even leaving town. A reprise of the carnage from Unite the Right in Charlottesville concerns rally organizers and Richmonders alike. Locals are confused about who is coming, how many of them, and what connection, if any, the groups have with the white supremacists, nationalists, and alt-right groups that marched on Charlottesville. RVA Mag spoke to Thomas Crompton, a US Army veteran, and the founder of CSA II: The New Confederate States of America, to learn more about their rally and what their group stands for. Cromptonsaid they were founded in September of 2015, and have registered CSA II as a trademark for their association. He runs the organization with his wife, Judy, and the two sell merchandise, raise money for disaster relief efforts, and support a wide-range of activism around Confederate symbols and groups. When we called, they were in Florida providing disaster relief to people affected by the flood with Tara Brandau, an associate from the Florida 3 Percenter security group. 3 Percenters describe their movement as a patriotic defense of the Constitution, but they’ve been criticized as anti-government extremists by the Anti-Defamation League and the Southern Poverty Law Center. Brandau also serves as the media liaison and a co-planner for the Richmond rally, and Crompton directed questions about the rally to her. She stressed the motto found on the CSA website, “Heritage – Not Hate”, and expressed antipathy for the KKK, secessionists, and the neo-nazi groups that marched in Charlottesville. She said Unite the Right and its affiliates are explicitly disinvited, a sentiment echoed on their social media, and that she anticipates 50 or so people, but has no definite count. Planning for the rally began after Unite the Right in Charlottesville, stoked by fear that the Lee Monument faced imminent removal in Richmond. 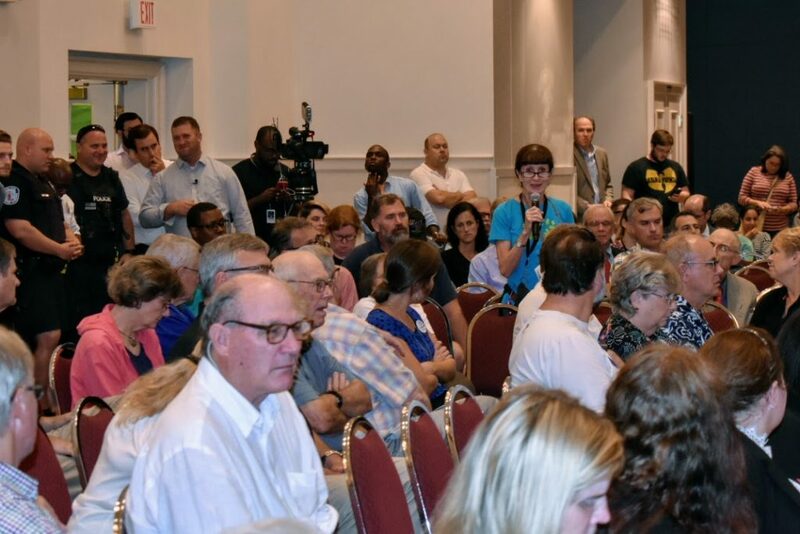 They posted the event on Facebook after Mayor Stoney’s Monument Avenue Commission expanded its scope to consider removal of the monuments, and Brandau identified Governor McAuliffe’s recent statement as a compelling factor in the timing. Removal of the monument is currently illegal, but procedural votes to allow for future removal have been proposed in the General Assembly. Brandau said they had a broad base of support in Virginia, but all coordination has occurred with the police, not with local affiliates in Richmond, although RVA Mag couldn’t verify a local presence for the organization. While they have state chapters on Facebook, most of these are empty outside of the Cromptons and a third administrator, and the Virginia one only has 24 people listed as members. RVA Mag reached out to several people via the Facebook event but none responded for comment. When told that locals were concerned about the open carry, she insisted that they were a peaceful group, although she is an outspoken activist for the Second Amendment. “We’re doing it for their safety, too. We don’t normally open carry, but we worry after Charlottesville,” said Brandau. Brandau claimed to have worked with the Department of Homeland Security in Jacksonville, Florida, to unmask anonymous white supremacists, and also claimed to have helped expose Alex Michael Ramos, a man accused of participating in the brutal beating of DeAndre Harris. Ramos turned himself in after being identified in a video of the attack, posted on social media by racial justice activists. RVA Mag once again was not able to verify any of these claims, but she did distance their efforts from other groups flying the Confederate Flag, going so far as to say they’ve misused the symbol to falsely support hidden agendas of secession, racism, and discord. Many in Richmond and throughout Virginia have a different take though. Scharf’s organization has partnered with the First UU Church of Richmond and Virginia Interfaith Center for Public Policy to host a counter-event on Saturday. Their event, the Richmond Stands United for Racial Justice Rally, will start at the Maggie Walker statue and march down Broad Street. “With a pro-confederate group from out-of-town planning to come and march on our street, we needed to provide an opportunity for people to stand together in a spirit of love, unity, and nonviolence,” she said, describing the impetus behind the rally. Both Scharf and Cullen Montgomery, one of the locals organizing the CORVA counter-protest, were in Charlottesville, and they expressed concerns about open-carry. “All of us that were in Charlottesville saw how the presence of weapons served to intimidate people,” said Scharf. Montgomery had the same concern, and said that pepper spray and baton attacks in Charlottesville were backed up by the threat of worse violence from firearms. The group has prepared evacuation plans and will be watching for threats to local synagogues, a particular concern after the Nazi influence on Unite the Right. Montgomery was dismissive of efforts to separate the CSA and 3 Percenters from white supremacist groups, describing it as a smokescreen, and pointing to CSA social media support of the Bundy militia occupation. Both the participants of Unite the Right and the CSA have rallied to support Confederate monuments, but the CSA has explicitly disinvited groups with overt white supremacy missions like the KKK. 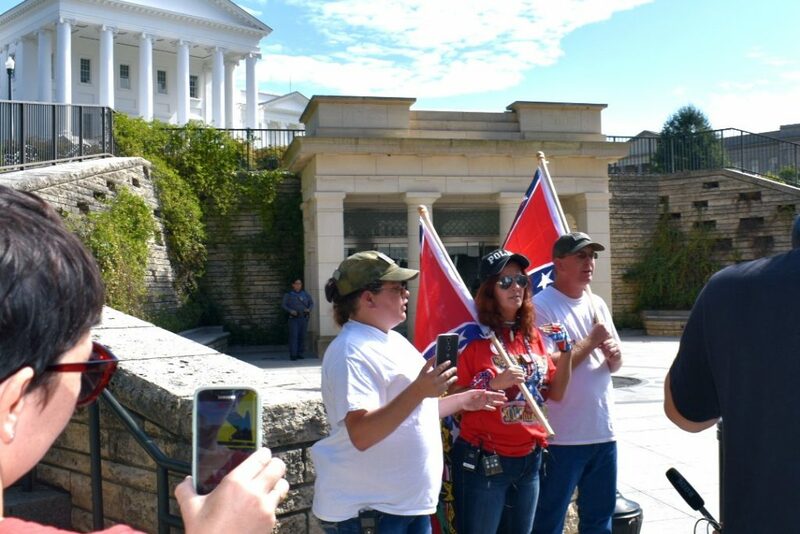 Even local neo-confederates, the Virginia Flaggers, are no longer welcome; Brandau described them as a group with good intentions who have become infiltrated by secessionists and white supremacists. Another resident, Danielle Canonico, was disappointed that the event was happening at all. She said it had upset a lot of her neighbors, and while she understood the importance of exercising rights, she felt that the firearms in a family neighborhood were an act of intimidation. “Marching with weapons just escalates the situation,” she said. She’s not worried enough to leave town, but she has plans for that evening to counter the negativity of the rally. She’ll be raising money for Sportable, a non-profit that helps people with visual and physical disabilities to play sports. The Richmond Police have spoken to neighborhood associations and are holding a community discussion at the First Baptist Church this Thursday at 6 pm to address concerns. We’ll continue reporting on this story as it unfolds.